A child injury is one of the most terrifying experiences a parent may face in life. Fortunately, children are less likely to experience permanent health issues in an automobile accident than their adult counterparts. This is because children's bodies are more malleable than the bodies of grown adults. The body of a youngster when subjected to abnormal forces tends to bend without breaking. And when damage does happen, it tends to be less severe due youth's ability to heal faster and stronger. 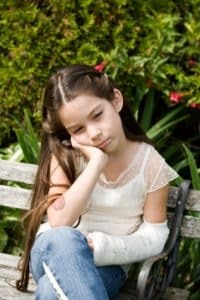 Nevertheless, child injury is real and when it is severe the victim's qualify of life can be significantly diminished forever. It is therefore important for a parent to be vigilant and to watch for signs in the days and weeks following the incident. Back or neck pain. If your youngster is complaining of pain or soreness in their back or neck in the days or weeks after the incident, that is something that warrants a follow up with a physician or chiropractor. An x-ray and/or MRI study can be used to identify problems with the bones and soft tissue in the back and neck. Spine injuries are serious and can last forever. Headaches. Where your son or daughter complains of headache, be concerned. Traumatic brain damage can occur during a sudden jolt in a crash, even where there is no visible sign of head trauma. Do not let brain trauma go undiagnosed. A follow up with a neurologist for testing may be necessary where a family or emergency room doctor believes it is warranted. Nightmares and/or Fearing. Physical problems not the only type that a little one might develop. Youngsters can develop psychiatric harm as well. If your kid is suffering from nightmares or unwarranted fear, or is acting out, they may be traumatized by the car crash. This can happen when they witness a hurt parent taken away in an ambulance, or when a youth loses a parent or sibling to a major accident. Without proper counseling and therapy, a youth could go the rest of their life with psychiatric trauma related issues. While nothing can undo the fact of physical and/or emotional trauma, steps can be taken to help recover from it. An injured child should get the medicine and counseling necessary to ensure that the negative effects of the harm are diminished or eliminated. For parents needing to obtain proper pediatric care or with finances, a lawyer is a good place to start to find answers. Lawyers may be able to effectively implement the law to obtain financial compensation to pay for medical treatment, psychiatric treatment, pain and suffering and loss of life enjoyment. An attorney may also be able to give needed guidance on how to document health conditions and obtain needed treatment where medical insurance is not available to pay. 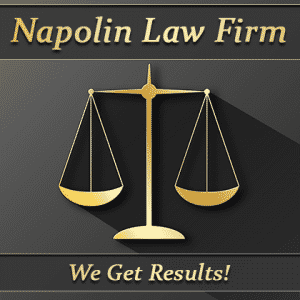 If your son or daughter has been injured in an automobile, truck, bus or pedestrian accident, The Napolin Law Firm is here. Call us and speak with a compassionate and knowledgeable lawyer, free of charge. If you, a family member or friend have any Child injury related legal issues or questions please contact our law office for answers to your law questions. Call Now: (909) 325-6032.